More than $40-million dollars allocated to fund trail development during mayor’s tenure. 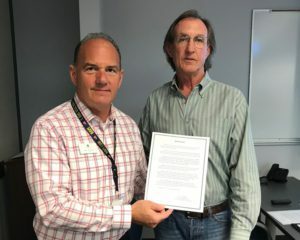 The Linn County Trails Association board passed a resolution Monday night recognizing Cedar Rapids Mayor Ron Corbett for his public service and contributions to trails infrastructure during his time in office. Mayor Corbett was instrumental in reallocating the formula for the distribution of federal gas tax funds for trail development—from 5% to 80%—during federal funding years 2016–20, greatly assisting in the expansion of the recreational trails system in Linn County during that period. The Hoover Trail extension, from Ely to the southern Linn County Border, is the first trails project to benefit from the funding reallocation and will open this month. A public ribbon cutting ceremony will be held for the Hoover extension on Saturday, October 14, 2017 at 10 AM behind Ely City Hall. Numerous additional trails projects have benefited from the funding prioritization and will see construction in the next 5 years, including the CeMar Trail, the Lindale Trail Extension, the Edgewood Road Trail, and the Cherokee Trail. 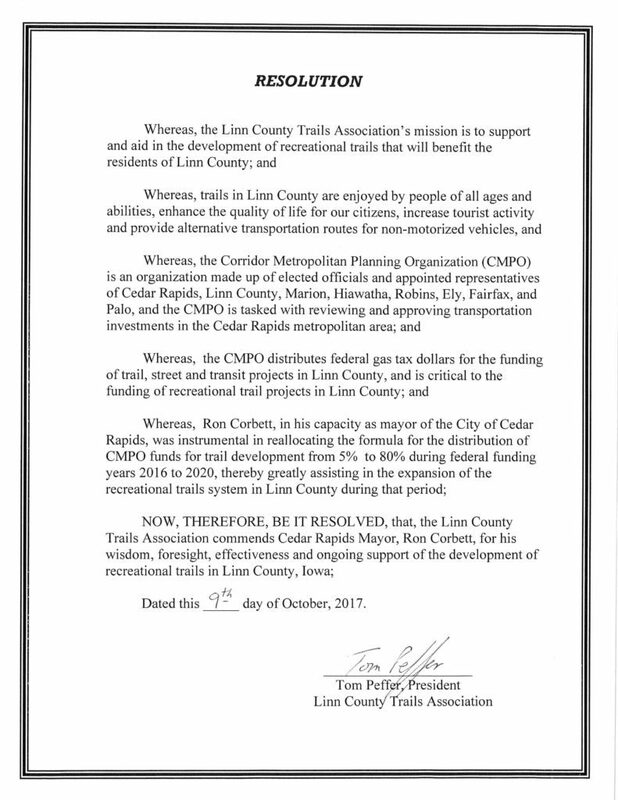 Linn County Trails Association commends Mayor Corbett for his wisdom, foresight, effectiveness and ongoing support of the development of recreational trails in Linn County.